Life is not a "dress rehearsal"! Jeremy celebrates his 30th Birthday!!!! 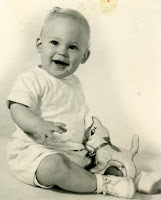 Hard to believe that our little boy is married and celebrating his big THREE - OH!!! Jeremy always loved music and movies. No surprise that they are still his favorites. (The title of this post taken from Mr. Destiny.) 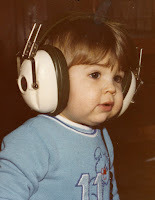 As you can see, Jeremy took to listening to music early. Check out those 70's ear phones. Have a great day, J-Man. September 30th, Miss Zoey Boey Boo Boo Head turned two years old. She recently came home after a visit to the groomers with a cute purple bow. Don't think the camera caught how cute she really looked in person. Happy Birthday, Zoey! It is our beautiful Suzanne Stradley Quist's birthday and she is turning the Big 3-0! Suzanne and Jeremy are still in New York and we are here in Cali but we will get to celebrate with them soon. We hope your birthday is the bestest ever! We just got the news! Jeremy and Suzanne will be moving back to California in October 2008. Suzanne got a great job with her current publishing company in San Francisco. Her new manager loved her so much they volunteered to pay for relocation (which originally they weren't going to do). Jeremy will start looking for his perfect job with his 'fancy' masters degree from NYU. And of course they will look for a nice location to live in the Bay Area. Yes, just 2 hours at most away from family. We are soooooo excited, it has been 12 years since Jeremy has lived this close to Sactown. Today he turns double nickels. I'm not sure how this is phasing him. I know that some of his friends want to go order off the senior's menu at Denney's. Tonight we are going to eat suishi and go to music in the park. I'm sure there will be golf during the week as well as BBQ events for the 4th. What a fun week! Happy Birthday to Dee!! Yes, the matriarch of the family had her x@* birthday this year and today officially ends her birthday week. She got to be a princess on her day, Zoey and Mocha actually let her sleep in, she was taken out for breakfast and enjoyed a concert in the park that evening! Yeah!! Last Christmas, we added to our family by adopting a Yorkshire Terrier named Zoey. We call her the "amazon" Yorkie since she is bigger than most dogs of her breed. We like to take Zoey everywhere we go, but lately she insists on barking at everything which has limited her outings. Zoey fits in perfectly with our family. Mocha re-joined our family in February 2008. He enjoyed 16 years and was quite the 'old man'. He definately "cramped" Zoey's princess-ship! 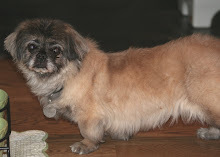 Mocha left us on December 7, 2008. We all miss him, even Zoey.